Since World War II, the very name of Adolf Hitler stirs revulsion in the hearts of every person who lived through that period of dark history. While Adolf was a popular first name for boys prior to the war, it is rarely used today. France and Norway went so far as to outlaw the name. Because he inflamed Germany into launching one of the most destructive wars in history, Hitler is remembered as the most evil person who ever lived. Yet Hitler was a popular political figure among the Germans during the 1930's. He moved the nation into a socialist system of government and his policies brought about a rapid economic recovery from the Great Depression. He also achieved a denunciation of restrictions imposed on Germany after World War I, and annexed territories that were part of the old Germany. 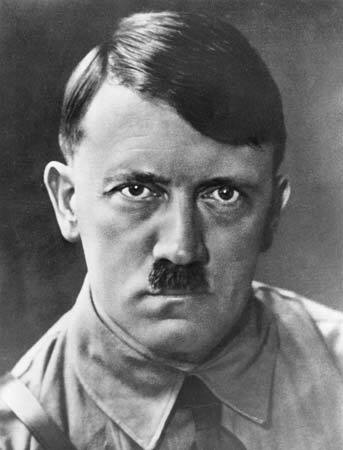 Hitler rose to power during a period of deep financial crisis, when Germany was recovering from defeat in World War I and the entire world was suffering under the Great Depression. Hitler’s policies brought stabilization to Germany’s failing economy, created jobs, developed popular social programs and regenerated national pride among a defeated people. Hitler was a genius in that he was able, in such a short time, turn a defeated people into a war engine the likes of which the world has never seen. He brought together a team of scientists who helped develop technologies that still influence the way we live. The popular Volkswagen "bug" was designed and produced on his order because he wanted Germany to have a car for the common man. He was a dynamic orator who excited the imagination of all who heard him. Yet as the literal dictator of Germany, and because of his anti-Jewish ideology, the Nazi regime under his leadership brought about the genocide of an estimated 5.5 million Jews and millions of other nationalities including Romanians and Poles. Hitler and his followers saw these people as racially inferior. The German army also slaughtered an estimated 19.3 million civilians and prisoners of war, plus an estimated 29 million soldiers. The mass slaughter of humanity under Nazi forces was almost unprecedented in the history of modern warfare. As the war unfolded, Hitler was joined by Italian and Japanese forces, thus expanding the war from Europe and Northeast Asia south into Africa and west into China and the Pacific Theater. And it all began with Hitler’s decision to invade Poland on September 1, 1939. France and England declared war against Germany two days later. Japan bombed Pearl Harbor one year later and the United States immediately declared war against Germany and Japan. Prior to the invasion of Poland Germany succeeded in establishing the territory of Bohemia and Moravia (now the Czech Republic) as a "Protectorate" of Nazi Germany. Hitler justified the intervention by claiming that Czechoslovakia was coming apart and that the German military was seeking to restore order. The objective was obviously to increase the size of Germany’s borders. But once it all escalated into a world war, with forces from the United States, Canada, Australia, Russia, Britain, France, Belgium, Brazil, China, Denmark, Greece, Netherlands, New Zealand, Norway, South Africa and Yugoslavia teamed up as allies against the Axis armies, the battle eventually turned into a struggle for survival for Germany. Italy entered the war in June, 1940, and was the first force to be defeated in 1943. The Nazi army remained in Italy, however, so fighting continued there for about another year. Germany’s attack on Russia proved to be a big mistake. The Russian forces eventually drove the Germans back while U.S. and allied forces landed in France and the war front closed in on Berlin from both the east and the west. Germany surrendered on May 7, 1945. Hitler and his bride, Eva Braun allegedly committed suicide in Hitler’s bunker as the Russian army closed in. Japan surrendered on August 14, three months later, after the United States launched an atomic attack. It was only after allied troops entered Germany and Poland grounds that the terrible truth about the Nazi concentration camps became known. It was learned that Jewish, Romanian and Polish citizens were rounded up and taken to these camps where they were starved to death, lined up and shot before mass graves, or gassed. The time is remembered by Jewish families as the Holocaust. Hitler was seeking a super race of blond haired, blue eyed people to apparently rule the world. He believed they were a superior race to all others. He was conducting a radical form of ethnic cleansing, the likes of which the world has rarely seen.